I've been thinking about making some gingerbread cake for a while and as I was going through some old copies of Cooks Illustrated looking for the vegetarian mincemeat recipe that I've made for the last couple of years, I came across this recipe. 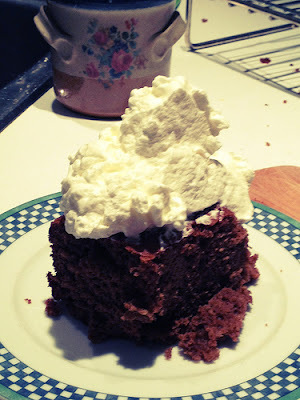 Whipped it up last night and served it with slightly sweetened whipped cream. Awesomeness. 1. Adust oven rack to middle position and heat oven to 350 degrees. Grease bottom and sides of 9 inch square baking pan; dust with flour and tap out excess. 2. Whisk together flour, ginger, cocoa, cinnamon, cloves, nutmeg, allspice, baking soda, and salt in medium bowl. 3. Beat butter, molasses and sugar in large blowl with electric mixer on medium speed until combined. Beat in egg until incorporated. Gradually add buttermilk and milk until combined. Add dry ingredients and beat until smooth, about 1 minute, scraping down sides of bowl as needed (do not overmix). Scrape batter into prepared pan. 4. Bake until top springs back when touched and edges pull away from pan, about 35 to 40 minutes. Set pan on wire cooling rack for 10 minutes. Dust with Confectioner's sugar, if desired (or whipping cream) and serve warm or at room temperature. (gingerbread can be wrapped in plastic, then foil and refrigerated for up to 5 days).